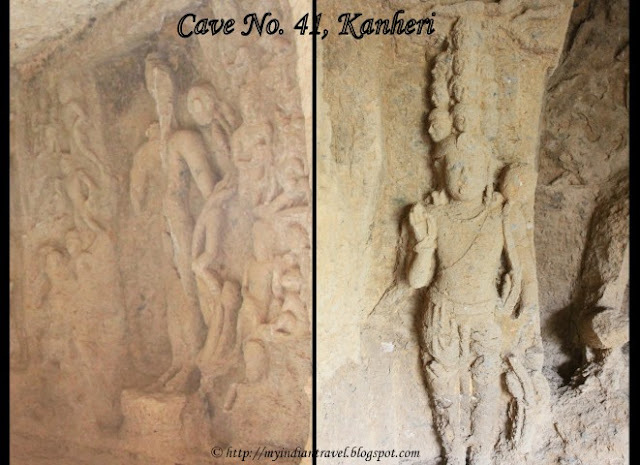 Cave No 41 of Kanheri is one of the important cave in the area that is built sometime around 3rd century B.C. The cave consists of a porch in the front followed by a verandah and a hall. The porch is supported on four pillars of square shaft topped with cushion capitals and square abacus. The veranda can also be reached from the sides of this front porch. The hall is approximately 26 feet long and 22 feet wide with many Buddhist icons carved all around. There is a cell in the centre of the back wall, inside which a Buddha image flanked with two attendants is carved. One of the important sculptures here is Litany of Avalokiteshvara and the Eleven-headed Avalokiteshvara. Unfortunately the Litany of Avalokiteshvara is much defaced hence the ‘Eight Fears’ are almost disappeared. Eleven-headed Avalokiteshvara is only one of its kind in India. Thisn Buddha here is depicted with four arms. Rajesh...It is so nice to be back and looking at your wonderful captures of your beautiful country's treasures. I have started going to the Bodhi Path services here. I have fallen in love with the people and their way of and outlook on life. I always leave feeling so calm and rejuvenated. Because of my dear friend I spent so much time with and lost from pancreatic cancer, I was introduced to the Budhist community here. That was a blessing. Hope you have a wonderful picture filled week. Amazing photos. It would be great to see this in person. Nice captures of the beautiful works. What a great find you've shown us! Love the close up shots of the carvings. I don't think I have seen more beautifully carved and constructed caves. Interesting cave and sculptures! The eleven headed sculpture is unique with heads one above another, unlike ravana with 10 heads extending on sides. What an amazing place!! And fact that it was built SO long ago is even more amazing!! Wonderful post/photos for the day, as always, Rajesh!! Thank you for sharing!! I hope you have a great new week!! The design is mind boggling. Where can you read up on all these? Awesome - the porch looks very solid and the stonework is amazing. An amazing site the Kanheri caves!! How lovely - so full of history. It is fascinating to think of all the work it required to excavate these structures and carve them so long ago! I hope thye will be preserved for the future! Fascinating photos and such history! Beautiful! Thank you for more amazing architecture. What do I say every time I see your pictures? Oh yes... I MUST visit India someday! Again, amazing craftsmanship on display, with none of the modern tools at their disposal. A wonder. Truly. Just when I think I cannot be astounded anymore of the Indian structures, you show me something else, Rajesh. Wow!